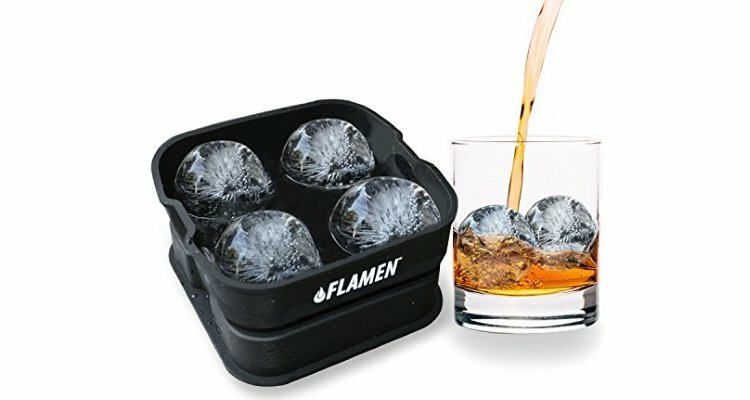 ★ GREAT GIFT- AMAZON BEST SELLER ICE BALL MAKER: Makes perfect 2-inch ultra-slow melting ice spheres - perfect for whiskey, scotch, bourbon, cocktails and much more. ★ BPA-FREE SILICONE TRAY: It is FDA Approved! Its is a flexible tray that will NOT crack in the freezer. Looking rather like a case of bombs, these trayful of ice balls certainly packs a punch when it comes to keeping drinks refreshingly ice cool. So you have a cold drink. But the room is warm and the sun is shining, and that drink ain’t gonna stay cool much longer. So what’s the plan? Ice cubes can help, but they have this annoying tendency to melt away to nothing and disappear amazingly quick – not to mention watering down that drink waaaaay too much. Whiskey stones could also be an option, but are they really as cold as you’d like? No, what is really needed here is a stunning, ice-cold, frozen sphere bobbing about gracefully in that drink, keeping liquid refreshingly cold in style and for far longer than measly little traditional ice cubes. What’s more, these beauties are absolutely stunning and will instantly jazz up any drink with a rather sophisticated touch. Imagine a sleek cocktail or an enticing cup of ice coffee topped off with an elegant, crystal-like frozen sphere… now we’re talking! The round shape of these ball presents less surface area than the equivalent amount of ice in the shape of small cubes, resulting in a far slower melting rate than regular ice cubes. And if you really don’t want any melted water in your precious drink, make these balls with the liquid of your choice and your drink will be kept blissfully cold, with zero risk of being diluted. And one more thing: you know how fiddly and downright annoying most ice cube trays are, right? Well this beauty of a tray is made of flexible silicone, so when the ice is ready, just pull off the lid, bend the tray, and watch those smooth, frozen spheres pop out with ease right into a nice cool drink. The BPA-free silicone tray is dishwasher safe and won’t crack in the freezer, making it the perfect and hassle-free tool for the conscientious and classy host or hostess.